William Elliot Kyle was born in Hawick in 1881. He worked as a joiner and later became a coal merchant. Willie was probably the most famous Hawick Rugby player of his day. 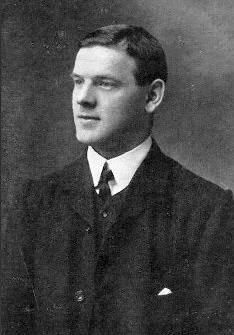 Playing as a forward for the Hawick Rugby team, he went on to gain 21 International caps for Scotland between the years 1902-10. His first International was against Wales at Cardiff and he holds the distinction of being amongst one of the first Scottish Rugby Internationalists not to have went to public School. Willie was the Hawick Cornet for the year 1905, his acting father was J.E.D Murray and in 1927 he became the President of the Callants Club, In the years 1930 and 1931 he was the President of the Ancient Order of Mosstroopers. The Kyle's were well-known in the town for being supporters of the Common-Riding, Willie's father, Alexander Kyle who was a tobacconist at 3 Tower Knowe was Cornet in 1872. His Grandfather John, known as the 'Nether Wulton Youth' on account that he was a great runner in his youth, was the Acting-Father for his son Alexander in 1872, and held many positions within the common-riding organisation. In 1899 he attended his 59th Common-riding dinner, a record at that time. Along with the Common-riding, the family were also stalwarts of Lodge 111, Willie was the Master of the Lodge in 1912 and 1913, and his Grandfather John Kyle was Master in 1868-69-70. Willie's father however never attained that rank as he died a young man of 29 in 1885. A legendary story regarding Willie Kyle and the Lodge occured at the annual visit to the Henry Scott Riddell monument on the 25th July 1908. 16 Brethren from Lodges 36 and 111 made the trip to Teviothead by horse, amongst which were 4 Past Masters of 111, the Bard of 111, a Past Master of 36, two Hawick Cornets and a 'famous' rugby internationalist, being Brother Willie Kyle who was Senior Warden at the time. The day was a torrent of rain as the horse riders made their way by the side of the river Teviot from Hawick to Henry Scott Riddell's cottage. On reaching their destination the group dismounted and soon removed their soaking outer clothes and after having being fed and watered by the schoolmaster and his wife in the small cottage, it was time to scale the hill on which the cairn stands. On their arrival at the monument by which time the rain had subsided, the group came across what appeared to be a crippled Jackdaw. Willie Kyle known for his turn of speed and egged on by the party gave chase to catch the bird. When the cunning bird tired of tormenting its would be captor by staying out of reach rose in a swoop into the air and left poor Willie staring at it in bewilderment, nuch to the amusement and howls of laughter of those in attendance at this game of chase and catch, which Willie Kyle was never going to win! Willie Kyle married Jessie Henderson Grieve in 1910, in Hawick. He was recorded as a Joiner in the 1911 census, and living at 12 Duke Street, Hawick. William Elliot Kyle jnr was born 1911, Hawick. Willie died in 1959.